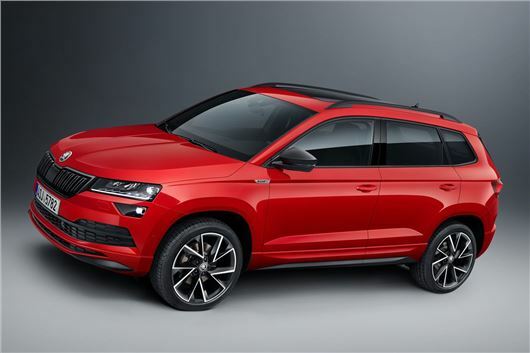 A day after revealing the Karoq Scout, Skoda has announced plans for a sporty version of its compact SUV badged the SportLine. Available with a variety of petrol and diesel engines - including a new 2.0-litre TSI petrol producing 190PS - the Karoq SportLine looks about as sporty as a Skoda SUV can get. Sports bumpers and 19-inch alloys contribute to this, as do tinted windows and black roof rails. Inside, black sports seats with contrasting silver stitching brighten what is normally a fairly grey cabin. The pedals are stainless steel, while the multifunction sports steering wheel is covered with perforated black leather with silver stitching - all sporty touches. Buyers can opt for a Virtual Cockpit to replace the traditional dials. Exclusive to the Karoq SportLine is a fifth display mode which displays the rev counter and the current speed in the centre. Enthusiastic drivers can also flick between drive modes via the driving mode selection. Prices are yet to be announced for the Skoda Karoq SportLine, but we'll find out more when it's revealed at the 2018 Paris Motor Show in October.